Can you imagine doing Paris in a day? Malavika Bhattacharya takes the Bustronome to discover that the seemingly impossible task not only feels breezy, but that you are left with ample time to wine and dine along the way. Cramming Paris’ highlights into a single evening is a seemingly impossible and extremely unfair task. You can’t possibly miss out on grand, historical icons like the Notre Dame and the Grand Palais. But then how do you make time for French gastronomy, sipping fine vino in a cosy bistro, and the refined art of flânerie? To solve this problem, entrepreneurs Jean-Christophe Fournier and Bertrand Mathieu seem to have taken inspiration from the title of Ernest Hemingway’s Paris centric novel – A Moveable Feast. 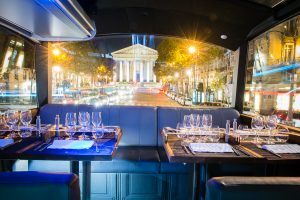 Taking a wine-accompanied gourmet meal on the road is the Bustronome, a novel concept that allows you to dine lavishly while taking in Paris’ top sights. 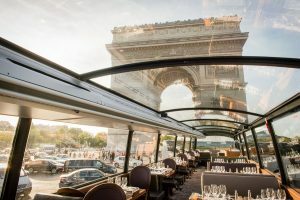 The glass-topped, double-decker bus rolls down the glittering Champs-Elysées, and then proceeds past city landmarks like the Louvre and the Madeleine, before a well-timed halt at the sparkling Eiffel Tower. The tour is suited to first timers in Paris, or even those looking for a whistle-stop excursion of the city’s highlights. Offering a four-course lunch and six-course dinner service on board, grand city views are accompanied by refined French flavours and wine. My dinner featured light and flavoursome innovative plates: beef and curry popcorn sweet corn risotto, a char fish fillet with sanshos butter, duck with figs and grapes, classic French cheeses, topped off with an indulgent pear, praline and dark chocolate dessert. Guests can sip on a glass of bubbly or choose from an extensive wine list. Both lunch and dinner have two services each, with a 90-minute lunch and nearly three-hour dinner. 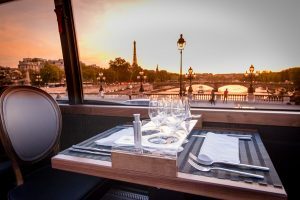 We dine in the glass-ensconced upper deck of the bus, treated to panoramic views of illuminated monuments and Parisian streets. Each table is equipped with nifty audiopens, a modern take on audio guides, which provide insights into the sights we drive past. At the Eiffel Tower, we hop off just in time for the hourly sparkle, before bundling in again to warm up with cup of tea before we end the night with full bellies and a head full of lovely Paris sights and sounds. As Audrey Hepburn famously said, “Paris is always a good idea”. Even if just for an evening. © 2017 Bustronome. Legal Notices. Developed by Made with ♥ by CosaVostra.